There are SO MANY parties, potlucks, and gatherings coming up that I’m out of my mind excited! Many require me to get my booty in the kitchen, which I’m 100% okay with as long as what I’m bringing is quick, easy, and MAKE AHEAD. Are those not the two most glorious words ever? I always like to have a few default make ahead recipes for each season that I can whip up the night before when the chickpea is sleeping and simply bake or toss together the following day. I’ll include a little recipe round up of my favorites at the bottom of this post if you want a few more ideas for your arsenal. These scrumptious seafood stuffed mushrooms can be made the previous day and baked up to bubbly perfection just before serving. I’ve employed this technique both when hosting my own little shindig and even when taking goodies to friends houses. Granted you’ll have to commandeer their oven for 20 minutes but chances are, they won’t mind one bit. Especially once they bite into one of these fresh-from-the-oven crab stuffed mushrooms. Just be sure to bring the tray out to the guests before someone camps out in the corner of the kitchen popping mushroom after mushroom in their face. Oh yes, this has happened multiple times. I promise not to name names. Y’all know who you are! what type of crab should I use? For these crab stuffed mushrooms, I typically grab a package of fresh, chilled lump crab meat from the seafood section of my grocery store. I also like using chilled crab claw meat which is has great flavor. I’ll usually snag whichever is on sale! You could even run with the seafood stuffed mushroom vibe and add some chopped sautéed shrimp or cooked salmon to the mix. It’s delicious! Without further adieu, let’s stuff some mushrooms! These killer crab stuffed mushrooms always vanish fast! We love them so much I even make them as a side dish with dinner every few weeks. 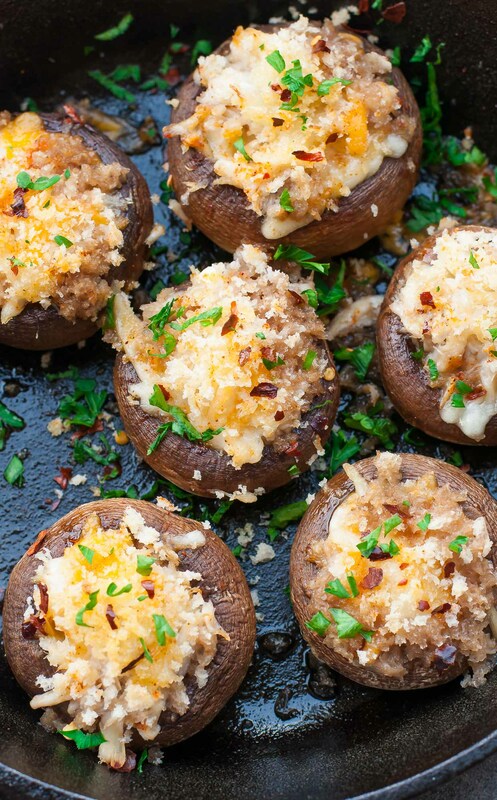 We can’t get enough of this easy mushroom appetizer! 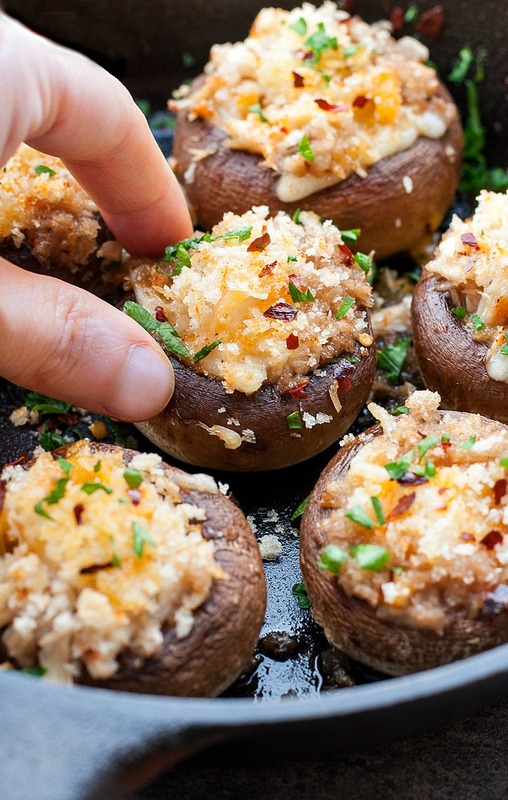 If you get a chance to try these crab stuffed mushrooms, let me know! Leave some love in the comment form below or tag your photos with @peasandcrayons on Instagram so I can happy dance over your creation. Easy appetizers FTW! You miiiiight want to double the batch. 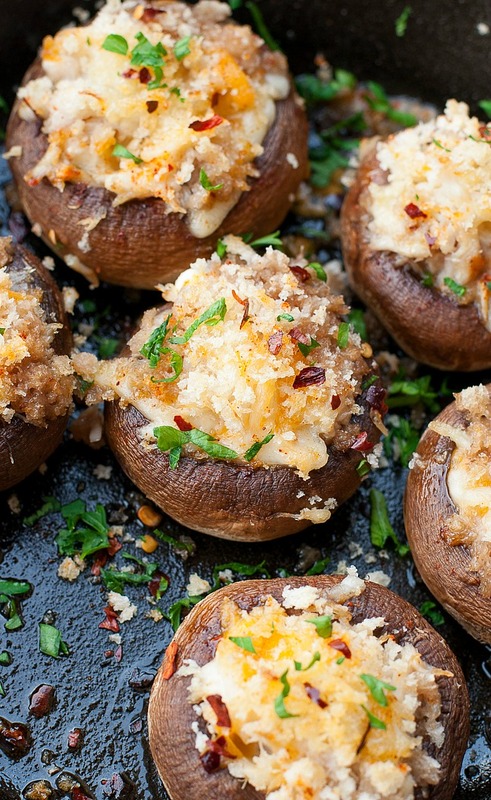 These scrumptious crab stuffed mushrooms get scarfed FAST! Hi, Jen! I made these last year for a Christmas appetizer and I want to make them again. Do you have any tips on dealing with the moisture that’s released from the mushrooms? Mine tasted delish last time but the serving platter was a bit messy. Thank you for the awesome recipe! Hey Stephanie! So excited these bad boys are making a second appearance! I’ve actually read a few things offering tips and it seems like pre-cooking the mushrooms is the best bet! They’ll give off their water and then you can stuff and heat them just long enough to warm the filling and you’re good to go. I’ve had something like this at a restaurant before but never tried making it at home. I’m so craving these right now! I’m going to have to check out your other stuffed mushroom recipes too! Thanks for sharing! Who doesn’t love great party food? These are the perfect bites to serve and celebrate with! Love them! I’m a total mushrooms lover and this is where I head when they’re on the party table. Love them!!! Oh my goodness, these are so amazing!!! My mushroom hating husband doesn’t want them in the house, so we’ll make them when he’s on a business trip, haha! In your recipe for crab stuffed mushrooms you mention removing the mushroom stems but you don’t mention trimming the foot and then chopping the stems and adding them to the crab filling. I use portabella mushrooms and hate to waste any part. Store bought mushroom stems are very edible. Do you shred the gouda? I’m assuming, but unsure. Have you ever tried this recipe using an egg and parmesan instead? Planning to make these for Christmas dinner. Hi Rosary! You’ll use 4 ounces of crab meat for this recipe. 🙂 Enjoy! 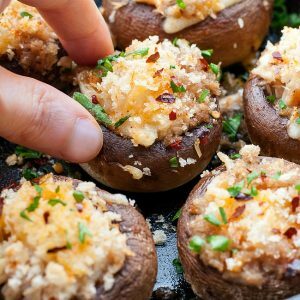 I have made the similar recipe using Large Portobello mushrooms, take out the gills, use similar stuffing mix and then grill them or bake them in the oven. This makes a meal in itself using the Portobello’s and then a small salad and your enjoying the best. I have used crab and also shrimp as well as chicken and sausage inside the Portobello’s, then you can change up the other ingredients to match what protein you are using, or go totally vegan if you wish. My mother loved to come visit if I served stuffed mushrooms with salad and shrimp cocktail for dinner with a few drinks before dinner naturally. She always said I had to fix that menu whenever she and my step father were on their way to Texas and past thru our town to visit on their way to winter at South Padre Island. Miss that lady so much. Bon Appetite. Did you add chopped up mushrooms to the sauté veggies? Not clear on that step on your recipe…so I added 4 chopped up mushrooms to it. Another fun party recipe!! I make my stuffed mushrooms with a vegetarian filling. Need to give this crab version a try. Looks SO good. Heck yes, these look wonderful! So delicious! Thanks Annie! They’re beyond addictive! Dang these look and sound awesome! I’ll have to make these for my husband, he would LOVE these! Thanks Kimberly! Hope they’re a total hit! These look and sound amazing! Pinned for future use! My mouth is watering! I know what I am making for dinner tomorrow night, these look great! I used this recipe with a couple of modifications and these were great! I used cream cheese as my cheese, and I also added 1/2 tsp of ground mustard and a bit of lemon zest. Next time I will also add a dash of Worcestershire. One thing that was confusing to me, however, was the instructions for the mushrooms. I read this as the actual mushrooms should be cooked before stuffing. I would clarify between stems and mushrooms. Thankfully I have made stuffed mushrooms before so I did not precook the actual mushrooms. I actually just used more crab and discarded the stems. Thanks Dan! I’m sorry that step was a bit confusing, I’ll fix it right away! I’m glad you loved the mushrooms and appreciate the feedback! Hope you have a lovely holiday weekend! Yay for food blogger rambling glad I’m not the only one. These are perfect for making ahead – I’ll take a whole batch please! These sound amazing! I’m pinning to make for one of our many holiday parties coming up. Thanks so much Emily! <3 Hope they're a hit! Ohhh i love this idea!! It’s been ages since i’ve had a stuffed mushroom and what better stuffing than crab? And you’re right – sooo many parties to look forward to coming up. I can’t wait! Mushrooms are one of the best veggies to be stuffed with wholesome goodness! Damn it Jenn! Why do you do this to me? Haha. Oh my gosh, these look so good! I learned “late” in life how much I love mushrooms, so this would be a great party dish! 1. Are the diced mushrooms the stems that you removed? 2. Is the 1/4 cup Panko mixed in and an additional amount used for topping?? Thanks so much, looking forward to trying these! !